A totally random meeting happened on my annual holiday roadtrip. 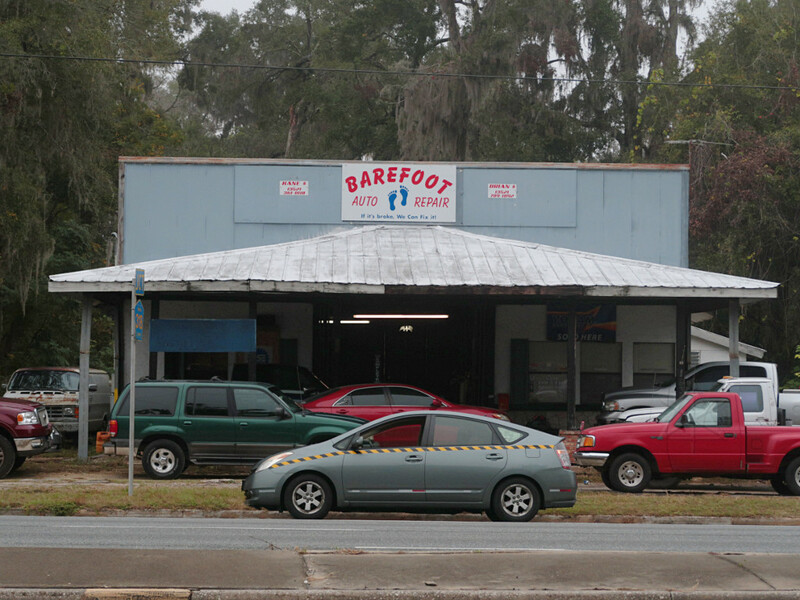 I was pausing for a light on US 301 going through Citra FL, which is about the last town I reach before transferring over to I-75, and on a quick look around spotted "Barefoot" on a sign over a little building on the side of the road. It looked like the type of storefront that so many of are shuttered and dead all along that whole stretch of 301, but this one appeared to not only be actively occupied, but by an auto repair business. The light went green and as I started forward, I thought "I'm going back for that, at least a picture of the front", and turned around. Nobody seemed to be visible out front so I just planted the car along the margin of the road with the hazards flashing, and dashed back across the highway. I got pretty much what I wanted in an "I was there" type of shot, but at the same time I was burningly curious about the building's occupants. I approached the open shop door with a couple of "hello? "s, and eventually heard someone calling out "c'mon in!" from inside the office on the right. Two fellows looking *very* much like mechanics were sitting at desks inside, hunkering in the office with the space-heater going against the 45-degree "Florida winter" day outside. They both had workboots on, and my first thought was a disappointed "okay, false alarm, it's just a name they picked for the place". Because let's face it, an auto shop full of sharp, heavy metal crap is about the *last* place most of the mainstream would think anyone would want to be barefoot in, right? But those of us who understand how overblown the real-world "safety risks" are would have no problem working in an environment like that, and even appreciate having the full sensory feedback and the ability to utilize all four extremities in the workflow. So I needed to find out which type of folks I'd found here. Almost feeling stupid about it, I asked them if they did their work in the spirit of the sign outside. The answer was a pleasant surprise: yes, about 90% of the time they are shoeless in the shop and loving it. They had barely even noticed *my* feet up to this point in the conversation, but now they started to realize why I was asking. One guy had his shoes on in part because the previous day he'd banged up his big toenail on something or other, but he was totally not worried about it and if anything both of them were trying to keep their feet a little warmer on this Florida-chilly day. The brothers Kane and Brian have been car and racing enthusiasts for many years, primarily barefoot throughout, and not only developed a bit of a reputation in those circles, also had the local establishments rather well-trained in acceptance. "You'll find Citra to be one of the most foot-friendly places around", one said. 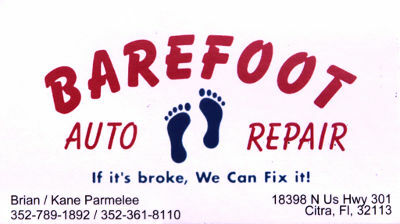 I asked if they were aware of all the supportive online resources about barefooting, and they actually weren't. I ran off a short list and handed Brian one of the Outbarefoot cards, and he said "wow, this makes me so happy" or the like -- here was evidence that they were far less alone in their bucking of misguided social customs. I told them about all the fun I'd had hiking Breakneck Ridge on that same trip down. They had a couple of good stories of their own -- like educating some newbie manager at the Winn-Dixie in town who insisted that there was some law against being barefoot ... but when asked "show me the law! ", backed down with some kind of "I don't have time for this" excuse. Or the family restaurant down the road, where some customer whined about the barefoot brothers a couple of tables away, and was told by the waitress, "well, if you have a problem with them, the door you came in through is right over there -- we don't discriminate against our customers". In other words, exactly as any such complaint should always be handled. I was already thinking of how I wanted to do a page about these guys, and described my growing website-list of positive/negative interactions which I'd be happy to add them to. Free publicity! I told them how I had spotted the shop by pure chance and went to snag that first picture, and they were like "wanna do a picture of all of us outside?" as they started pulling their own shoes off. This was about as awesome as it could get, and was making *me* really happy to have discovered these guys. So here we all are out front! To set up the timed shot I freely walked between the camera propped up on a truck hood and where we stood, over the strip of dirt which had any number of little sharp objects laying about. Nobody worried about it; the brothers didn't even try to caution me about anything because they could immediately see that I knew what I was doing just like they did. This was one of those places where as odd as it may seem, I might be more concerned about my own car tires than my feet. They don't have a website per se, but they do have a facebook page with some information. Here's a shot of their card. They're also pretty easy to find with a simple search or two. As of late 2017 the shop hadn't been open under this name for too long, so I figured they'd get more specific online resources set up sometime later. This meeting totally made my day, and I continued my journey in very high spirits. We didn't get time to actually discuss any car tech -- we could have probably gotten into some long fun dicussions about anything from old diesels to modern hybrids and EVs. In fact, I didn't even get any sense about how the fellows are as technicians, as we didn't tour around the shop itself or talk about any of that stuff ... but with their length of hands-on experience and clear ability to think outside a few boxes, I'd be pretty confident about them going in.